1 Comment on What Is Shaker Style And Who Were The Shakers? Anyone who has looking into getting a new kitchen or even any new kitchen furniture will have come across the term shaker or shaker style. While this term and the style is very popular and has been for some years the fact of the matter is, most people have never given the origin of the term a thought let alone know anything about it. The background to the Shaker style is actually very interesting and the style itself makes a lot more sense once the history is explained. The term Shaker Style is used to describe a wide range of interior items like shaker style bar stools, shaker style kitchens and more but what is shaker style and who were the shakers? This was the official name of the Shakers. However, the full name was actually The United Society of Believers in Christ’s Second Appearing. The organization itself was a break away group from the larger and more well-known Quaker religion. In the late 18th century the Shakers moved apart from the Quaker religion they were part of to create this new group. Despite being something generally associated with America Shakers actually began in England and then moved to settle in colonial America. The term Shaker actually came from the longer name “shaking Quakers”. This came about because of their body movements during worship. They would shake and move ecstatically during services earning them the nick name Shakers. These movements were often associated with their perceived messages directly from God through services and meditation. The name, however, stuck and was how they referred to themselves latterly too. Despite the time period the Shakers were in fact quite progressive. They were very keen on gender equality and women held leadership roles as early as 1747. They also believed in a communal lifestyle and pacifism. As well as these forward-thinking ideas the Shakers were also deeply religious in a more traditional sense and worked under the belief the end of the world was near and all sins must be renunciated. So where does the furniture and kitchen cabinets come into things? Well among their many specific ways of life and beliefs the Shakers were very keen on being self-sufficient. They were great craftsmen and made everything from food stuffs to furniture. But there is a key ethos behind this creativity that leads us to the definition of the “shaker style”. They believed that manufacturing should be honest and avoid any kind of deceit. So much so they actually thought processes like veneering wood was against their religion. They felt honesty in the creation and appearance of furniture was very important. They became well known for making reliable, durable and high-quality furniture as a result and it was this method of production that lead to the Shaker style we know today. At the time many American furniture makers were using imported wood like mahogany and rosewood. This was no good for the Shakers who chose to use local woods like cherry, pine and maple. They also avoided any detailed decoration which again became a strong part of the overall Shaker style. They painted furniture using natural colors too. One really key factor in the Shaker style is the choice of wooden door knobs on cupboard doors and the like. This came about because they refused to use imported brass like many other makers. The Shaker style itself still stands today. The simple clean lines, wooden handles and subtle decoration are all key to this ever-popular option for chairs and kitchens. The difference these days is that many of these points are mixed with other styles now and much of the pure Shaker tradition is lost. Veneer finished kitchen cabinets are common place as well as additions like glass fronts to cupboards. 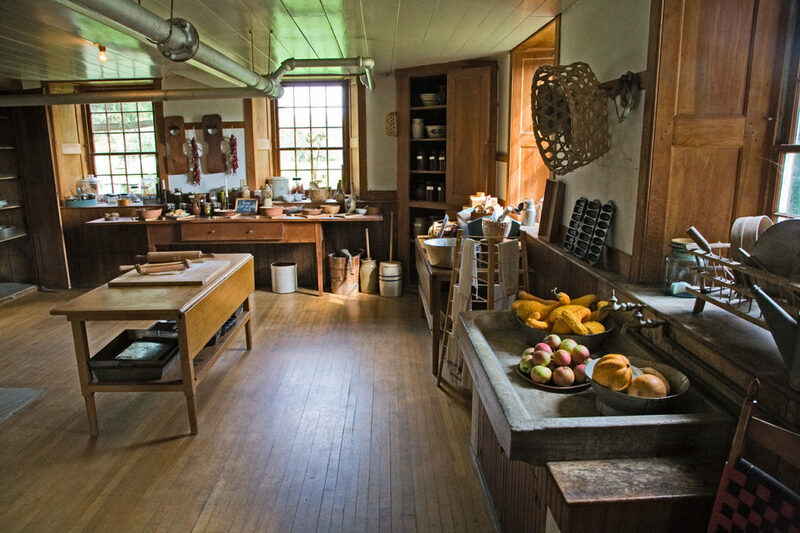 It is also fair to say the original Shakers may not have approved of pairing a Shaker kitchen cabinet with modern gadgets like flat screen TVs and wireless phone chargers. That being said, the style lives on and many furniture makers still create items very close to what would have been made originally. The idea of simple, high quality furniture is something that will never go out of fashion. While many may feel the beliefs and methods of worship the shakers used are now very strange there is no denying these led to a dedication to quality and honesty that most people would appreciate when spending lots of money on household items. There is also a lot to be said for their treatment of women and approach to violence! Ade Holder is a professional copy writer specializing in a number of areas including interiors and interior design. He has been writing in this space for nearly 10 years. He is currently working closely with a creating content in partnership with www.cheekychairs.com who create designer dining chairs and bar stools. I hear that Ikea do some really nice Shaker Style Cabinet Doors. Wood paneling looks really good also. I will definitely opt this style, it gives the kitchen a rustic homely feel. Just make sure a checkered tea towel is hung up somewhere to complete that look.